The above photo is courtesy of David Faldet, son of S/Sgt Melbourne O. Faldet, Radar Mechanic, 60th BS. Click on the left section/center section or right section of the above image to enlarge that area and view the names of the men in that section of the photo. The names are were provided by David Faldet, per the identication key on the back of his father's photo; Rank and position were added per the 39th BG (VH) database, which was compiled from the names listed on various orders pertaining to 39th BG (VH) personnel. 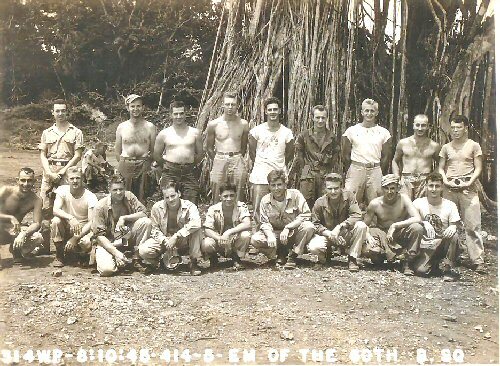 While the AAF title block shows "314 WP 8:10:45-414-5-EM of the 60th B. SQ" there is a notation on the back of the photo with the idenification that states "Radar Men of the 60th Bomb Sqdrn Taken by group photographer Guam, Marianas Islands."